The devastating 145+ mph winds and storm surge of Hurricane Katrina did NOT inflict any damage to at least 7 of our Sam's Club/Wal-Mart fueling stations in the "direct hit" area. Meanwhile, other buildings and structures in the immediate adjacent area were total losses. Photos of the typical fueling stations involved. NASA utilizes two MEKCO fiberglass buildings. See more on NASA's website. A view of the newly installed X-band scanning ARM precipitation radar, one of three that will be installed at the SGP site with Recovery Act funding. 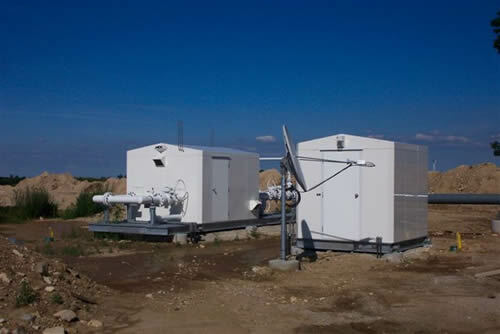 These dual-polarization Doppler radars measure cloud reflectivity, precipitation, and velocity at the 9.5 gigahertz frequency.